For those of us who live in smaller homes, townhouses and apartments moisture build up can become quite an issue. That is particularly true if our smaller living quarters remain closed from the outside world for most of the average day. Little or no cross-ventilation compounds the problem. A dehumidifier for small apartment use can be a great solution for moisture problems in smaller spaces. But where does that moisture come from in the first place? There are many sources of excess moisture that are produced during the course of a normal day. One of the major sources is the shower. In addition to this, washing dishes and the clothes dryer can also be major contributors to the humidity in a small space. Without exhaust fans or open windows, it just continues to collect. Excessive moisture – which is known as high humidity – can harmful to both your health and your home. It can lead to the development of mold and mildew which can rot wood, rust metal and make us sick from bacteria growth. However, humidity can be controlled to prevent this. An apartment dehumidifier is the great tool for the job. They come in many different styles, sizes and depending on the types, have various features to help control and maintain a safe humidity level. Here is a quick look at the types of dehumidifiers and what to look for. The way in which this type of dehumidifier works is much like an air-conditioner. Warm, moist air is sucked into the unit by a fan. The air passes over cooler coils, and as it does so, the moisture condenses and drips into a collection bucket or out through a drain hose for disposal. Some units then pass the cooler air over a heat recovery unit which warms the air before pushing it back into the room as warm dry air. These are usually priced from $150 to $400. The more features it has, such as a built-in humidistat and auto shut off the more it will cost. High end styles of heat pump dehumidifiers can cost $1,500 or more. This type of dehumidifier uses a sensor and an exhaust fan. It is a common choice for basements, attics, crawlspaces and other confined areas, or in industrial applications. The sensor indicates when humidity levels are at a set range and a fan kicks in to extract moist air to maintain the selected humidity range. If you need more information about automatic humidity control systems, please have a look at this article. These dehumidifiers use either a silica gel or a desiccant-type absorbent. In the silica gel style units, the gel is heated and attached to a wheel. A separate loop dries the gel and the moisture that is produced is removed with an external vent. Other desiccant-type products are moisture absorbing beads or salt that change color when they have collected a maximum amount of moisture. Heating them up ‘recharges’ them for future use. 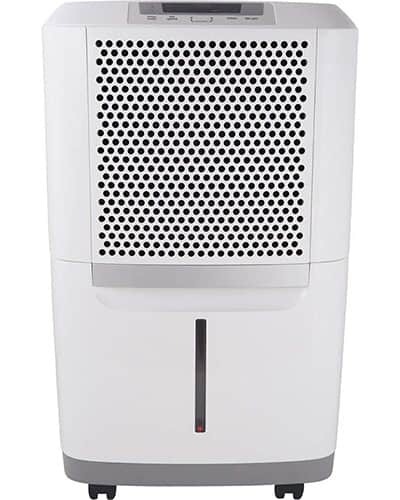 See our article on some of the best desiccant dehumidifier options here. Simple homemade dehumidifiers are made up of bags of de-icing salt. These extract dampness from the air and traps moisture that is collected in a gravity feed by a bucket. Both the salt and bucket require constant replacement. Here is a closer look at four dehumidifiers that are perfect for use in apartments. 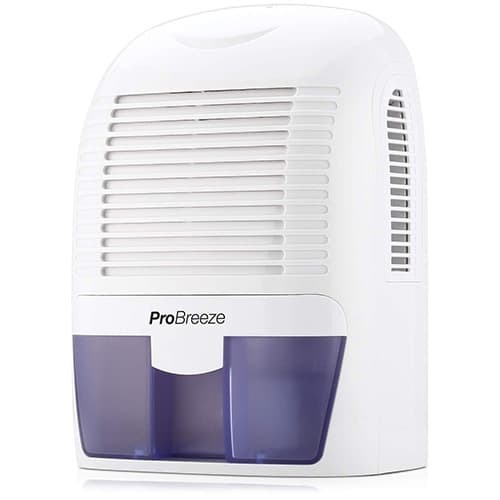 Lightweight, compact and portable are all words that best describe this effective little dehumidifier for a 2 bedroom flat or apartment. Although it may be small in size, it still does a big job of controlling humidity by removing up to 18 ounces of water per day. With a 52-ounce water tank capacity, you won’t have to empty it daily if you don’t want to. This is the perfect size for rooms and spaces up to 220 square feet. It has built-in thermo-electric cooling technology and runs without a compressor. When the water tank reaches full capacity, this unit will automatically shut off and an LED light will go on to tell you it’s time to empty the tank. It easily removes and goes back into place for smooth operation. 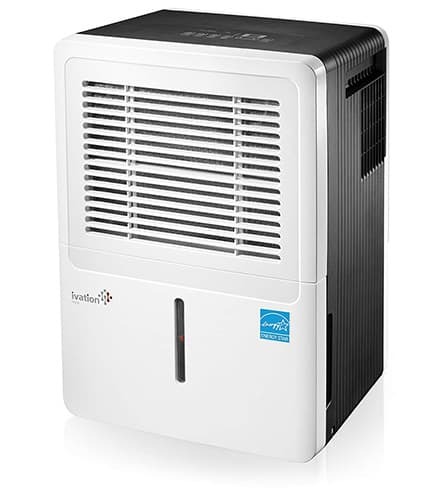 This is a compact compressor-style dehumidifier for small apartment use. It is small but powerful enough to remove up to 11 pints of water a day and is perfect for rooms up to 216 square feet in size. It is lightweight and easy to move around so you can use it in different rooms when needed. It features a Smart Touch display that is easy to read and lets you see current conditions as well as set humidity levels. The Smart System continuously regulates the humidity automatically. It also has a built-in air purifier that cleans, deodorizes and freshens air. This compressor-style dehumidifier is compact and energy efficient. It will collect up to 30 pints of moisture per day. It sits on casters which make it easy to move around and has a load of features including auto defrost and auto restart earning it the Energy Star certification. It is easy to operate – you just plug it in – and the settings are easy to use. There is also a bright LED display showing humidistat readings, the settings, fan speed, timer, when the filter needs changing and much more. This is our pick for the best dehumidifier for small apartment use. This compact unit provides effortless humidity control and will collect up to 50 pints of water from the air per day. 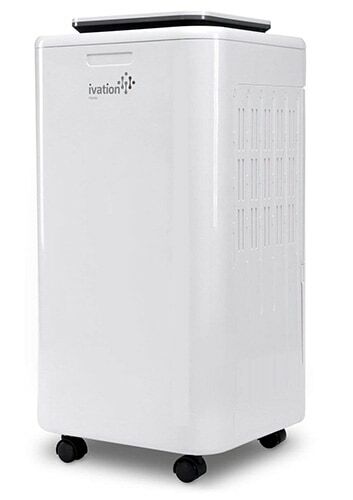 The design makes this one of the best dehumidifiers for basement apartment use and fits into any décor and it is small enough to be easily moved from one room to another. By using the drain hose attachment, this dehumidifier can be set up to provide continuous operation. There’s an alert to tell you when the water tank has reached capacity and there is also an auto shut-off. This is also an Energy Star certified product. There is an effective and efficient way to control moisture in a small living space such as an apartment. A compact dehumidifier is the answer and there are many on the market to choose from. Depending on the size of your living space, you’ll be able to regulate humidity easily with the best dehumidifier for apartment use.